Even from within the stone walls of the courthouse on Duckworth Street in St. John’s, it is difficult not to feel the overwhelming influence of the oil industry in Newfoundland and St. John’s in particular: the courthouse itself overlooks St. John’s Harbour, where you can view ship traffic from the offshore come and go. 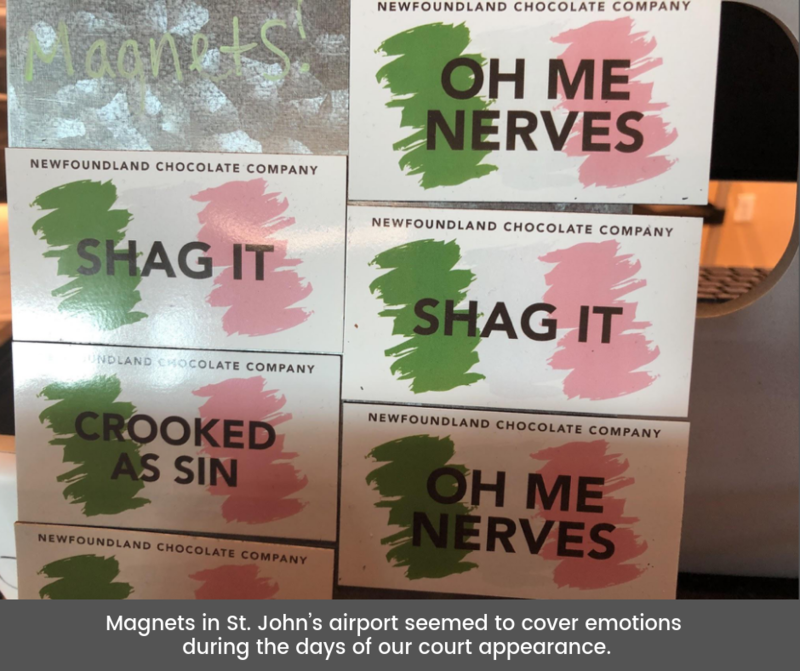 Those I met with reminded me that Newfoundland and Labrador needs revenue, and that the oil industry has a huge grip on almost every aspect of life. As the province’s budget gets tighter due to the drop in oil prices, lack of economic planning (such as establishing a trust from previous royalties), and by ballooning costs of the Muskrat Falls debacle, it is clear that oil and gas is seen as the pathway out. That’s why the province has announced The Way Forward - a plan to accelerate the offshore oil and gas industry, promoting a goal of 100 new exploratory wells in the next 30 years. The IPCC Report saying we need to shift away from fossil fuel reliance during almost exactly the same time period is clearly not anywhere on the agenda. Seeing oil as the solution is also why Premier Dwight Ball and Natural Resources Minister Siobhan Coady have been lobbying hard to weaken the new environmental assessment law - Bill C-69 - to pave the way for its rapid growth. Because you never know what a full and complete environmental assessment might uncover. Sierra Club, in partnership with the Grand Riverkeeper, participated in the environmental assessment for the Muskrat Falls, and were repeatedly stymied in trying to get adequate information to fully evaluate the environmental, social, and economic implications of the project, including risks of methyl mercury poisoning downstream. Lack of complete information needed to fully evaluate risks for the project, including the economic case, was echoed in the final report of the assessment panel for the project. Regardless, the project was approved by federal and provincial leaders. As someone who witnessed the unjust outcome of the incomplete assessment of the Muskrat Falls project, the fact that the province now wants to weaken, not strengthen, assessments that could prevent future ecological and economic disasters - such as a massive, uncontrolled oil spill in the North Atlantic - is infuriating. The rule of oil was very much on my mind as we settled in for our long-awaited hearing on February 25th. Our outstanding representatives from EcoJustice, Josh Ginsberg and Ian Miron, argued that since the licence granted to Corridor Resources exceeds the 9-year term laid out in the Accords Act, Corridor Resources is essentially a “squatter’ in the Gulf. That the Canada-Newfoundland Offshore Petroleum Board (C-NLOPB) has not correctly implemented its guiding legislation, the Canada-Newfoundland and Labrador Atlantic Accords Act, in giving Corridor even more time to drill after their licence term was up. That the C-NLOPB has ignored a clear, specific rule limiting the term of exploration licences to take an unreasonably broad view of its power to surrender and exchange licences in a way not intended to allow Corridor Resources to extend its licence for the same piece of ocean space even though it's time was up in January 2017. For their part, the offshore board argued that the court system should defer to the Board’s discretion in interpreting the Accords Act. The Newfoundland government, which intervened in the case, were present to support the offshore board and its position. Corridor, who also intervened in the case, echoed the Board’s arguments and said the Accord Act gives “extensive authority” to the offshore Boards. Having dealt with both offshore boards for decades - and seen the lack of the exertion of federal or provincial authority to protect fisheries, endangered species, and the environment - this sense of entitlement came as no surprise to me. Chillingly, the C-NLOPB lawyer warned, even if Sierra Club and its allies win our case, the offshore board could simply issue another call for bids in the Gulf of St. Lawrence. What oil company would want to explore there now having seen the decades of opposition we have raised to this is an open question. And one would hope that even our supine federal leaders might step up to protect critical habitat in the Gulf given the massive public pressure on them to protect right whales found there in recent years. For their part, Corridor Resources claimed that it had its “hands tied” by the environmental assessment processes and that the Crown’s obligation to consult with indigenous people created undue delays - and therefore, they argued,they deserve to have their licence extended. Why months, even years, would go by without Corridor making progress on assessments, is of course, an open question. Why any company would not anticipate having to undergo thorough assessment in the Gulf and that consultation with indigenous people would be an obligation is also difficult to comprehend. Corridor was not even charged the $1 million fee required for extending its licence - which occurred three times over the nine-year term. Isn’t that enough preferential treatment? 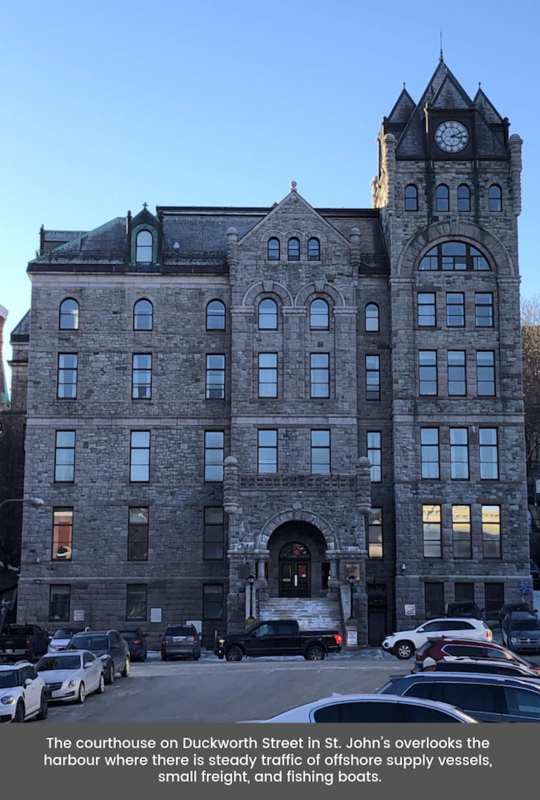 After a snowstorm shut down the St. John’s area, including the courthouse, our last day in court wrapped up with the judge asking questions to all parties, but the decision is now firmly in her hands. 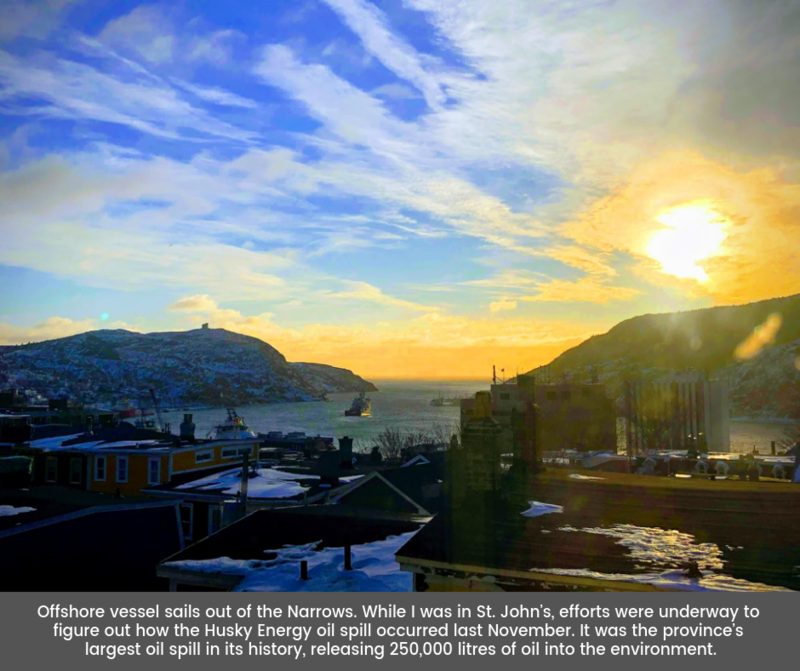 As I left St. John’s, a report  was released regarding the economic importance of the oil industry to the province. The report details the recent decline in the contribution of the oil industry to the province’s GDP from an average of 30% from 2010-2014 to a “mere” 23.2% from 2015-2017. A good reminder that for now, at least outside of court, the rule of oil still very much continues.